Karen Mueller is one of the top autoharp players performing and teaching today. Her exciting and innovative performing style, featuring Appalachian, Celtic and contemporary music, has been applauded by critics and audiences from LA to Boston. In 2006 she was inducted into the Autoharp Hall of Fame, twenty years after winning the International Autoharp Championship (1986), making her the youngest player recognized for either honor. Karen has made her mark on the acoustic music scene as both an interpreter of tradition and an innovator, and has performed with such legendary artists as Liz Carroll (all-Ireland fiddle champion) and Tony Trischka (banjo master). 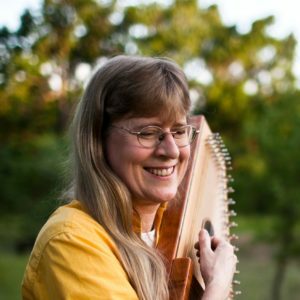 Karen has recorded four CDs: Landscape of the Heart, Clarity, Still Point and Autoharp Gourmet, and is featured on numerous anthologies, including Autoharp Legacy and Masters of the Mountain Dulcimer. She is the author of Mel Bay Publishing’s Celtic Autoharp book, and her own Autoharp Gourmet book. She maintains a year-round national touring schedule as a performer and workshop leader, and is also in demand in England. Based in Minneapolis, Karen gives private lessons to students of all ages and is an active teaching artist in schools, both independently and with Young Audiences of Minnesota. She has served as music specialist at Oak Hill Montessori since 1998, working with students from pre-school age to junior high. Her music has been featured in the last two editions of the Silver Burdett elementary curriculum materials used nationwide. Karen has taught and performed at weeklong programs such as the Augusta Heritage Center (WV) and Sore Fingers Week (England), and at festivals coast to coast, including the California Traditional Music Society Summer Solstice Festival, Mountain Laurel and Willamette Valley Autoharp Gatherings, and the Walnut Valley Festival in Kansas. In 2006 she co-founded the Seattle Autoharp Week. While touring extensively as a soloist, Karen also currently works with Katie McMahon, original lead singer of Riverdance, and is a member of the Celtic group Piper’s Crow, named “Best Acoustic Performer” in the Twin Cities in 2007. Karen is an accomplished multi-instrumentalist; besides autoharp, she plays mountain dulcimer, guitar, mandolin and Irish bouzouki. In 2000, the Minnesota Bluegrass and Old-Time Music Association awarded Karen its “Recognition of Excellence.” Karen was born and raised in Winfield, Kansas, home of the Walnut Valley Festival. It was there that she was introduced to the autoharp as a teenager and taught herself to play.